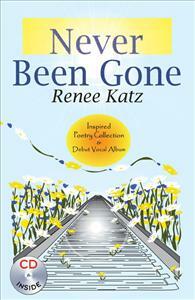 “Never Been Gone” is the debut combination poetry collection and vocal CD set created by the multi-talented New Yorker, Renee Katz. After enduring a horrific subway crime; and with the spirit and determination bestowed upon her by her Holocaust-surviving father, she became an accomplished cabaret singer, as well as occupational therapist. Her compilation speaks of perseverance and the joy that arises from the “gift of perspective” that an accident often brings; which usually comes from a lifetime of experience. It talks about embracing, rather than suppressing, hardship and how that ultimately yields compassion and love---the greatest gift of all. Never Been Gone is the debut poetry and vocal CD set created by accomplished cabaret singer and occupational therapist, Renee Katz. Her journey speaks of perseverance and embracing, rather than suppressing hardship, and how that ultimately yields compassion and love. I have listened to Renee's music and her poetry for years and years now and I know how powerful it is. Renee allows you into her life and her soul with her music and her words. Her voice and words never cease to move me and remind me how beautiful life is or can be if we allow it. If you have never heard her sing I can't urge you enough to listen to the CD. I promise it will bring tears to your eyes.